November 8, 2018 is a day that Nick Tomatis, Xfinity store manager in Chico, will never forget. That’s the day his entire hometown burned down during the deadliest fire in California’s history. It’s been three weeks since the Camp Fire started in Butte County, burning 153,336 acres, more than 18,793 structures and destroying the towns of Paradise and Magalia. With 100 percent of the fire contained, the death toll is up to 88 and approximately 196 still missing. 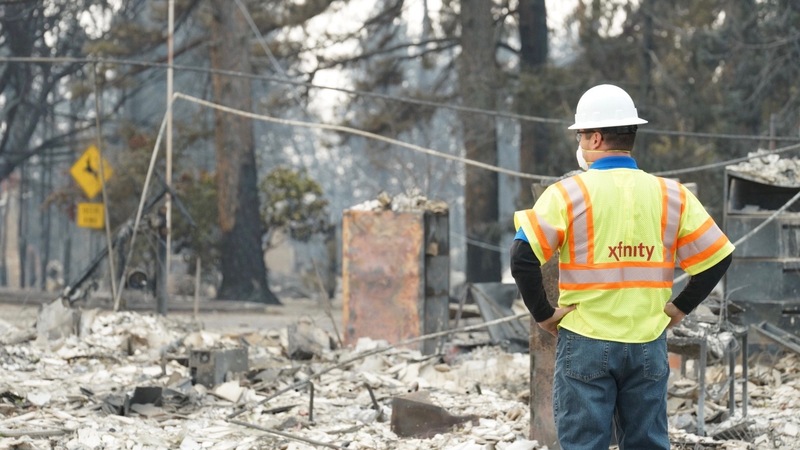 In the midst of the chaos, the team at the Xfinity store led by Tomatis has been serving customers who needed help managing their Xfinity services. “As you can imagine, there were a lot of emotions with the team and the customers coming in. Some of these folks lost everything. My first reaction was that I want to help them, hug them and make sure that we make their experience here as simple as possible. Our goal was to take at least one worry off their minds,” said Tomatis. Even though Tomatis admits that it’s been tough, he’s encouraged to see the community come together to heal. He too, along with the thousands of people displaced, called Paradise home. “I grew up in Paradise, my family lives there, I lived there for 20 years. My dad had his business since 1973 and from what I understand at this point, everything is gone. All those memories are gone. It’s been tough, but the support that I have received from Comcast and its leadership is unbelievable. From helping with hotel rooms and buying clothes and essentials for those employees affected to the $1.1 million in cash and in-kind support for the community. It makes me very proud to work for a company that cares this much,” said Tomatis. The Chico store was closed on Saturday, November 10th due to wildfire activity but reopened the next day. Since then, employees from surrounding areas have come to support the Chico store, some of them coming in on their days off. “They are here because they want to help. They have been distributing smoke masks, water and coffee and simply talking with the customers and making them feel comfortable,” Tomatis said. According to Tomatis, most customers come to the store worried about their equipment or their bills. During this crisis, Comcast will not charge fees for early termination, late fees, relocation fees or any other fees related to damaged or lost equipment. We will work with our customers to resolve any issues they may be having as quickly and efficiently as we possibly can. If a customer wants to suspend XFINITY services for an extended period of time, but would like to retain use of mobile apps such as Stream TV, Connect, My Account, XFINITY Home, and more, we’ll enable them to do so for up to four months and will significantly reduce their bills during this time.